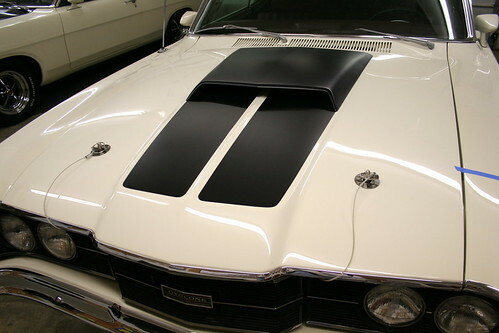 In 1968 the new fastback body styles of the Mercury Cyclone and Ford Fairlane had introduced the concept of aerodynamics to NASCAR. Up to that point horsepower had been the name of the game. However, there becomes a point when no amount of horsepower is going to push a brick through the air. The Blue oval engineers discovered that instead of building more horsepower they could gain speed by simply improving the body to create less drag. What was learned from the new for 1968 Fairlane and Cyclone Sportbacks on the NASCAR race tracks led to 1969’s AERO WARS on the high speed NASCAR Superspeedways. The auto manufactures were into manufacturing some pretty wild cars just to win on Sunday and sell on Monday. Although the factories knew the soon to be released Ford Talladega and Mercury Cyclone Spoiler II would set the pace on the track, Mercury wanted another car that could help publicise its winnings. Mercury also had some affiliations with a couple of pretty respected drivers. 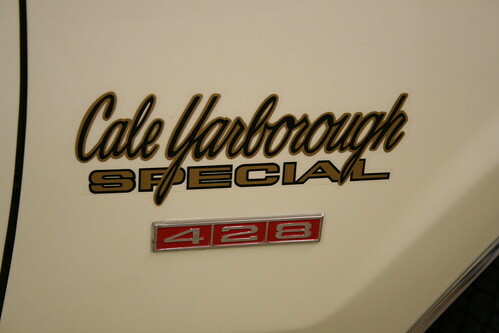 The NASCAR star in the SE was Cale Yarborough and he was driving Mercurys with the Wood Brothers number 21 on the side. The other star was from more of the sports car world and his name was Dan Gurney and he drove one NASCAR race a year. That race was the one at the Riverside road coarse in California. When he did his number was 121. In 1969 Mercury used these two racing stars from different parts of the Country and from different forms of racing to help promote their high performance efforts. The Cale Yarborough Spoiler was a regular Cyclone with a Spoiler Option and painted identical to his race car in the famous red and white scheme. The second car was painted in blue and white and carried the Dan Gurney name. This was the base car and did not include other options such as disc brakes or power steering. 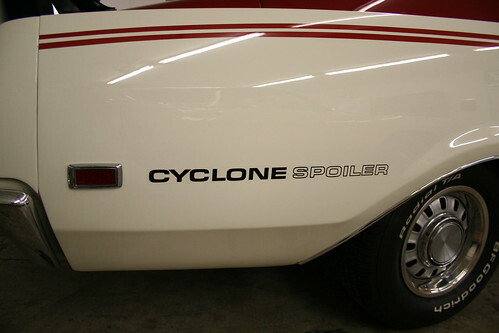 However, unlike the Talladega and Spoiler II the Spoiler could be equipped with any option otherwise available for a Cyclone. That means that a buyer could add air conditioning, bucket seats, console, even a 428 SCJ with 4-speed and the Drag Pack option! Because these cars could be optioned any way the buyer desired, it also meant that the interior color was not limited to red for the Yarborough cars and blue for the Gurney cars. Any color interior could be ordered up. 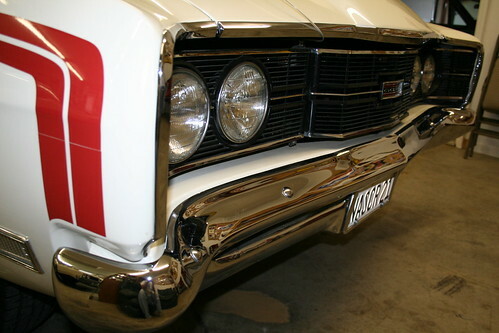 Spoiler production started in January after the Color Code Cars were built and before the Spoiler II cars although Spoilers continued to be built right up until the end of the regular build schedule for the 1969 cars. It is believed that all 390 and 428 CJ cars were built after the end of production of the Spoiler II. The Gurney Special is Blue and White while the Yarborough Special is Red and White. Only the Spoiler had a scoop and hood pins. No Spoiler II or Talladega should have scoops or hood pins. They were never available on the production cars. Both the Spoiler and Spoiler II should have a rear wing. However, these were dealer installed and some were never installed. Most were unpainted and left in their natural non-gloss black plastic color but a very few Gurney cars have been documented to have painted Blue Spoilers when new. It is unknown if they were painted at the factory or by the dealer. There were 352 Dan Gurney Spoilers and 617 Cale Yarborough Spoilers produced, 969 total. How do you verify that your car is a Spoiler? It is very difficult to do. Your car must have a least the options abover but could have more. It must have a MT or MX paint code but this code alone does not make it a Spoiler. The only sure way I know of is to have a Marti Report done for your car or find the Build Sheet for your car. 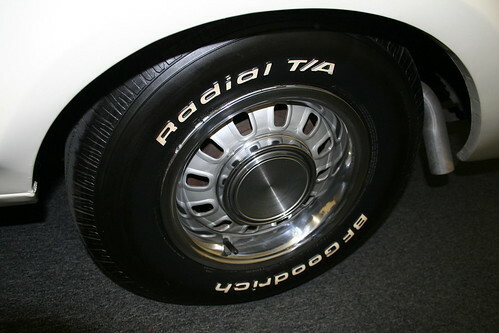 Here is the correct wheel for all Talladegas and Spoiler IIs. On the Spoiler you can easily see the gap between the grill and the bumper as well as how far back the grill sits. Also note how much shape the bumper has compare this with the Spoiler II. Great article. Unfortunately, I was only 17 back in the day when the 1969 Cale Yaroborough Cyclone was delivered to our house. We drove this car (my dad and I) for the next couple of years until I had the misfortune of introducing it to a tree on the highway between Fall Branch, TN and Kingsport. The vehicle was totalled out and we bought the carcas back for $500 from the insurance company (if only I knew where that thing was today). My dad ended up selling it for a profit to a guy who wanted the 351W/4V set up for his Ranchero. Flash forward to 2003 and lo and behold I found another Cale Yarborough car in Levelland, Texas. “Carolyn” sold it to me and I’m working on a restoration of it today! I hope to get this one back into the same look as the one I wrecked back in ’71. 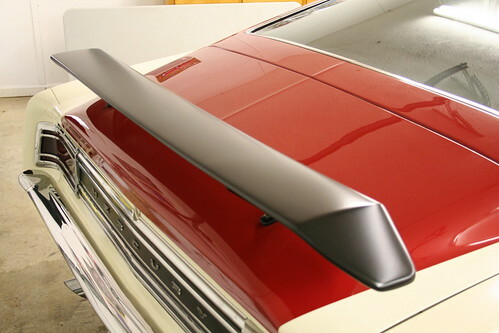 As an aside, Dad bought a 71 Cyclone SPoiler and still has it today! Rick, would love to see some photos of the car and make sure you register it on our site. There is no cost to do so and it is the only way we can begin to locate and track these rare cars. Join our Team Member group and you get a free certificate of registration!